You will be logged off in seconds due to inactivity. Click here to continue using this site. Do you want a fast and seamless checkout experience? Click here to download the expressPay Android app. Do you want a fast and seamless checkout experience? Click here to download the expressPay iOS app for iPhone and iPad. Welcome to expressPay, the easiest, fastest, safest and most convenient way to pay your bills and buy airtime topup straight from your phone. Create your account and get started. We're all about payments. 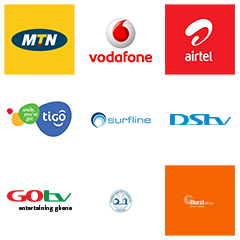 Billpay and buying airtime topup in Ghana made fast, simple, and secure. Learn more about what we're doing. We have sent you an email that contains a link to a page where you can create a new password. Haven't received your SMS Verification Code? Please contact our customer service centre on (+233) (0) 302 73 90 10 for assistance. Great! You're almost ready to start making payments. You will receive an email from us to complete account setup. Please confirm email address below.